The rich and privileged have fled the city, barricaded it behind roadblocks, and left it to crumble. The inner city has had to rediscover old ways-farming, barter, herb lore. But now the monied need a harvest of bodies, and so they prey upon the helpless of the streets. With nowhere to turn, a young woman must open herself to ancient truths, eternal powers, and the tragic mystery surrounding her mother and grandmother. She must bargain with gods, and give birth to new legends. Perhaps stretching the "apocalyptic" category a bit, this story takes place in a Toronto where wealth, privilege and government have fled, and immigrant and people of color communities attempt to survive with few resources. Drawing on Caribbean spirituality, the book combines dystopian themes with traditional folklore, peppered with horror elements and an overt political analysis. Apparently inspired in part by Detroit. 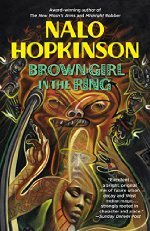 Author Nalo Hopkinson is on twitter. Lots of interviews available for more on her perspective. Welp. I don't know if this makes me a not so good club facilitator, but, although I've had this book on my mental "to read" list for years, I couldn't finish it. I got to the scene where Rudy's zombified slave is being flayed alive and I just couldn't hang after that. Overall, I thought it was great that this book is out there, but the style was just not my personal jam. I'm curious to hear other reactions... Until the whole flaying thing, I felt like I could work with it as a sort of exciting adventure tale with a political heart, but the.. didacticness? was a little off putting. But then with the explicitness of the violence it became not really worth it to me to finish. Interesting. I read a lot of horror so the flaying didn't bother me, and honestly it was nec. in terms of legitimately making Rudy a terrifying villain. I didn't know that Caribbean magical realism existed. I really love that style and so it was interesting to see it with a different culture. I will say a brief index of the orishas or even a brief list of useful resources or books for further reading would have been appreciated. I love mythology and so I did research into the various orishas, but pointing readers in the right direction would only deepen the understanding of the book. That said I really enjoyed how those elements intertwined with the story. The donated heart storyline was...forced and weird. Honestly, the book would have been much better without it. I know it was the driving force behind Rudy's behavior, but I'm sure something more organic to the family drama would have been better. The thing that REALLY pissed me off? Ti-Jeane's final attitude towards Tony. When all is said and done she says she's over him, yet not even five seconds later she's thinking "Maybe in the future...." Yeah that sounds like you're really over a drug addict ex who killed your grandmother and tried to kill you. Totally over it. While Tony's behavior can be...rationalized, I just can't be comfortable with a romance being reignited between these two and especially so quickly. It was just...really off putting. Oddly enough, we'd picked this book for November for my sci if book club (14 years and going strong!). I have mixed feelings about it. All in all, I think it's pretty incredible for a first novel-and the Caribbean magical realism really worked for me, too. I struggle with her work in general, though, because it often feels more like horror to me than sci do or fantasy-and much of that horror is directed around children. That's hard for me to read, and not typically something I'll choose. Still, I think overall mood in our group was pretty positive about this one. We liked that the main characters were all pretty flawed-a pretty believable young mother unhappy about her status, for instance.